UV curing has been a growth area for years, and the technology has evolved over time. Now, for a variety of performance and environmental reasons, UV LED has become a major opportunity in the graphic arts market. With that in mind, RadTech North America held UV LED 2015 in Troy, New York. In keeping with the interest in the area, the conference was sold out, with the talks drawing standing-room-only audiences. Attendees heard a wide range of talks and attended a tour of RPIs Smart Labs. After a tribute to the late Dr. James K. Ciravello of RPI, the conference opened with Jennifer Heathcote of Phoseon Technology, who discussed Technology Trends Driving the Adoption of UV LED Curing. Heathcote gave a general presentation on UV LED curing equipment. LEDs are going to increase in output, Heathcote noted. Laboratory LED work is being done at much higher levels. She added that higher outputs currently come with a tradeoff of shorter life. There is interest in curing at other UV wavelengths, but right now, Heathcote said that everything is being done at the UV-A level. In three to five years, we will start to have products with UV-B and UV-C, she added. Heathcote said that UV LED systems are far more complex than traditional mercury lamps. Construction and operation of UV LED curing systems have more in common with a smart phone than a microwave or arc lamp, she noted, pointing out the use of semiconductors and clean rooms. 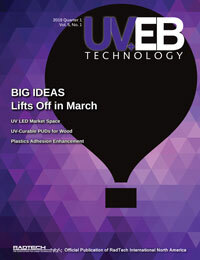 All in all, the UV LED market is making major strides in all areas. Life cycle testing has exceeded 50,000 hours, Heathcote reported. Market opportunity is expanding rapidly. Since 2008, the amount of projects and high-level meetings has grown by magnitudes. Everyone is looking at UV LED. Digital inkjet remains the largest market and, in the next few years, UV inkjet will be almost entirely LED. UV flexo is growing by leaps and bounds, and screen and adhesives also are growing. To illustrate the growth in UV LED in flexo, Heathcote added that at Labelexpo 2015, 35 percent of the UV systems on presses were LED, compared to less than 5 percent in 2011. Dene Taylor, SPF Inc., then focused on UV LED Inkjet – Its Inks Turn to Lead. Printing isnt just paper – it can be outdoor advertising, automobile interiors, containers and labels, furniture and fixtures, and building and home interiors, said Taylor. These days, everyone wants digital print. Inkjet is most versatile and productive. You can print porous materials – rough materials – with inkjet. UV cure adheres very well, with great color and durability, and it is cured immediately. Marvin Ruffin of Excelitas Technologies Corp. presented a talk on Improved Surface Cure with UVC LEDs, a look at the need for UVC systems. LED systems have many functional advantages over lamp-based systems, and formulation modifications have enabled the use of many UV LED-curable materials, Ruffin said. Surface cure remains a challenge, as free radical adhesives are susceptible to curing with a tacky surface when exposed to air. UVC LEDs are short wavelength, using 285 nm, which is the most efficient wavelength. He added that exposed adhesive and conformable coatings were tested with UVA and UVC, with the latter achieving a tack-free surface with a reduced UVA dose. The Status of UV LED Measurement Standardization was covered by Jim Raymont of EIT Instrument Markets. UV curing depends on the right photons, Raymont noted, and he updated the industrys latest measurement efforts. Patrick Henry of WhatTheyThink.com led a panel discussion on the Current State of UV LED Technology Applications. The panel included Paul Mills of the UV LED Curing Community; Don Duncan, Wikoff Color; Tom Hammer, Flint Group Narrow Web; Greg Palm, Mark Andy; Mike Higgins, Phoseon Technology; and Brian Chambers, Novagard. The UV LED Curing Community was formed to be a hub for information about UV LED technology, said Mills. Palm reported that 80 percent of Mark Andys shipments are on UV LED flexo. Operators want it because it is easier to run and they are running more, Palm added. After a tabletop exhibit and reception, Susan Bailey, adjunct professor, SUNY-ESF Outreach and technical development manager, IGM Resins, led a short course on The Chemistry of UV/EB, and tours were held at the RPI Smart Energy Lighting Center.